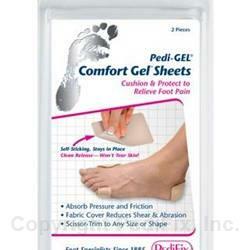 Soft Pedi-GEL® sheets cushion and protect to relieve pain, prevent calluses and reduce pressure and friction. Trimmable to fit any area. Smooth fabric cover reduces shear. Durable, washable and reusable to provide long-lasting comfort. Self-sticking pads adhere directly to feet or the inside of shoes. 2 per pack. Clean Release - Won't Tear Skin! Wash and dry affected area. Trim to desired shape or use as is. Peel off backing and apply. To remove, gently peel away from skin. Do not apply lotions, powders or medications to pads or skin when using Pedi-GEL® products. Keep packaging for storage when not in use. If you have diabetes, consult your doctor before using. Do not place product on an open wound. If irritation, discomfort or poor circulation occur, discontinue use. If symptoms persist, visit a foot specialist.